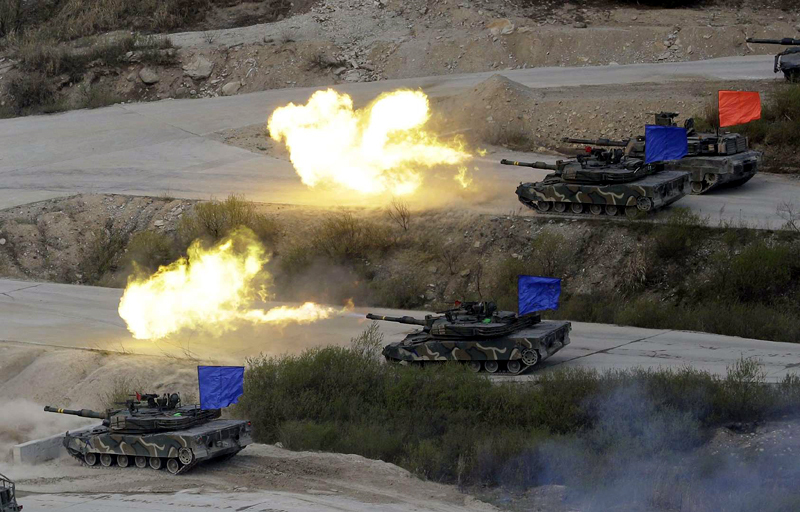 South Korean army's K1A2 tanks fire during a South Korea-U.S. joint military live-fire drills at Seungjin Fire Training Field in Pocheon, South Korea, near the border with the North Korea, Wednesday. April 26, 2017. The United States and South Korea have agreed to suspend a joint military exercise scheduled for August, South Korean and U.S. officials said on Monday, following President Donald Trump's pledge to end "war games" after his summit with North Korean leader Kim Jong Un last week. "South Korea and the United States have agreed to suspend all planning activities regarding the Freedom Guardian military drill scheduled for August," according to a South Korean defense ministry statement. It added that no decision had been made on other joint drills and the two countries would continue consultation on further actions. A U.S. official, speaking on condition of anonymity, said the exercise "Ulchi Freedom Guardian" would be suspended in line with Trump's comments and an official Pentagon announcement was expected in the coming days. Trump announced the end to the drills following his historic summit with North Korean leader Kim Jong Un in Singapore, calling exercises expensive and “provocative” - echoing a North Korean criticism that the United States had long rejected. The decision to halt military exercises in South Korea has bewildered many current and former U.S. defense officials, who only learned about it when Trump made his remarks. They fear it could erode the readiness of U.S. troops in one of the world’s most sensitive military flashpoints who have long prided themselves on being able to “fight tonight,” thanks to heightened training. Critics, including in Congress, warn that an end to joint U.S.-South Korean drills could also erode the effectiveness of the military alliance between Washington and Seoul. They also balked at Trump’s justification that cutting drills would save money.